Limited Edition England 1966 World Cup Final tribute presentation. 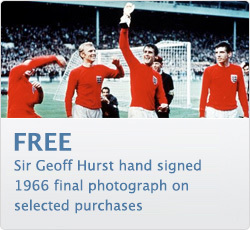 Hand signed by both World Cup Final goal scorers Sir Geoff Hurst and Martin Peters. Double mounted in red & white in a black contemporary frame including engraved name plaque.